Huckleberries are absolutely wonderful summertime fruits. While you can find huckleberries in a variety of places, they are especially common in the mountains of Northwest Montana where the climate is "just right" for their growth. Indeed, for all you hikers who venture to Glacier National Park to do your hiking, you can quite literally "eat your way up the trail" on many hiking trails there, as the berries grow wild and are readily accessible. Just watch out for the Grizzly Bears, though...as the huckleberries are a primary food source of the bears that live in Northwest Montana. This abundance of huckleberries in Montana shows up in many ways outside of a healthy and convenient trail snack. In Montana, you can find huckleberry jam, huckleberry jelly beans, huckleberry salsa and a whole list of other things that have huckleberry added to it. And one of those things is, of course tea. 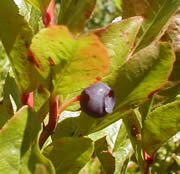 A number of huckleberry herbal teas are available, most of which come from Montana in one way or another. Listed on this page are reviews of teas on this site that have the primary taste of huckleberry to it. Simply click on any of the links to read the full review.